Terry McAuliffe is a Hillary Clinton pal. He fronted $1.3 million for her house in Chappaqua, New York. We should all have such friends. Thanks to the Republicans who shut down the government in 2013, McAuliffe is now the governor of Virginia, a swing state, and thus in a position to help Clinton get another house — on Pennsylvania Avenue. Any governor has political strings to pull, but Gov. McAuliffe is going beyond sharing voter information, get-out-the-vote operations and other traditional political tools. He's creating new voters by unilaterally restoring voting rights to 206,000 convicted felons. McAuliffe is focused on this: In 2012, Barack Obama's margin of victory in Virginia was 3.88 percent, which represented 149,298 votes. Now, it may or may not be a good idea to deny felons permanently the right to vote, serve on juries, hold public office or serve as notary publics. I'm personally open to the idea of restoring rights to ex-felons. But the law in the state of Virginia is very clear. The elected representatives have declined to change it, though some 69 resolutions to that effect have been offered since the 1980s, one as recently as this year. None passed the General Assembly. Gov. 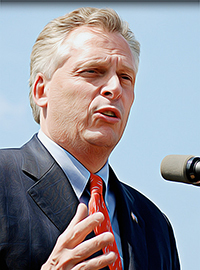 McAuliffe could have used all of the legitimate powers of his office along with his persuasive ability, such as it is, to urge the legislature to pass a bill he could sign. Instead, with the stroke of a pen, he announced that he was granting clemency to a whole class of people. We're focused, during this campaign, on the ethical sewer that is the Democratic nominee, but it's worth recalling that President Obama paved this road. He may not have been for sale in the Clinton style, but he has done something perhaps more sinister in the long run: He has demonstrated that a president can flout the law and pay no price. Remember the moral of Watergate — "the system worked"? Well, it didn't work in Obama's case. Though ultimately thwarted by the Supreme Court in some cases, he attempted unilaterally to alter immigration law, environmental law, civil rights law and much more, especially his own health law. For the most part, he was successful. The Washington Post's reporting notes that McAuliffe's action was popular, with 61 percent of respondents expressing support. What difference does this make to the law? If we're going to have government by plebiscite, let's repeal the Constitution and do everything by SurveyMonkey. "Scores of restoration orders have been issued for more than a century to specific felons who requested that their civil rights be restored. Never before, however, have any of the prior 71 Virginia Governors issued a sua sponte clemency order of any kind, whether to restore civil rights or grant a pardon, to an entire class of unnamed felons without regard for the nature of the crimes or any other individual circumstances relevant to the request. What is more, we are aware of no point in the history of the Commonwealth that any Governor has even asserted the power to issue such an order." Virginia's former governor Tim Kaine, now a vice presidential candidate, was asked to do what McAuliffe has done, but he decided that a "blanket order restoring the voting rights of everyone would be a rewrite of the law rather than a contemplated use of the executive clemency powers." Citing his obligations under the Virginia Constitution, he declined. All prior governors, the court noted, had exercised their power to grant reprieves, pardons, commutations and rights restorations, on a case-by-case basis. This was consistent with the "cautious approach to any expansions of executive power" the court enforces, and "faithful to the belief that the concerns motivating the original framers in 1776 still survive in Virginia." The court ordered state officials to remove from the voting rolls the felons McAuliffe had restored and to keep careful records. Pretty definitive, right? Except Gov. McAuliffe is defying the court. On Aug. 22, he announced that 13,000 felons had been added back. So: Between July 22, when the court ruling was announced, and Aug. 22, did McAuliffe personally evaluate 13,000 cases? No. He doesn't even claim that. The only change from his previous executive order was the addition of a letter to each ex-offender, and McAuliffe has declared his intention to do the same for the rest. It may not make any difference to the 2016 election (which is not looking close), but it does undermine the rule of law in a flagrant and disgraceful way. Copyright © 2016 Creators Syndicate Inc.